Many derasars, temples and mosques dot the city of Ahmedabad. Amazingly though, amidst a certain one-sq km area within its walled city, there is a rather close yet peaceful co-existence of sacred places of worship of many different faiths—Christians, Parsis, Jews, Hindus, Muslims and Jains. 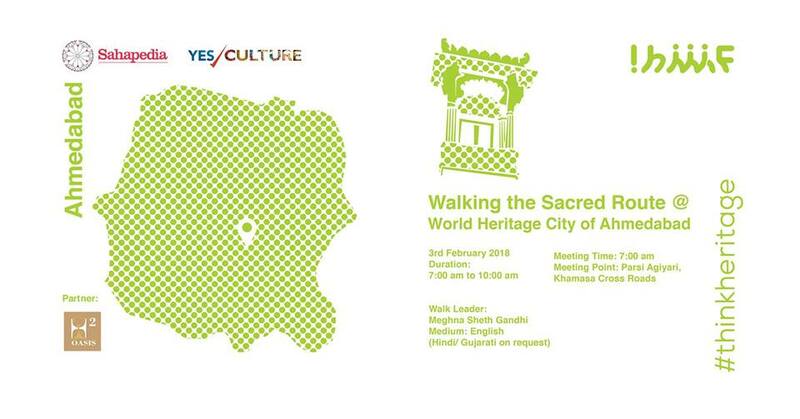 On this walk, we explore the unique symbolism, art, architecture and associated history of some of these sacred places and their respective communities, and allow ourselves a peek into the basic ideologies and belief systems of these faiths. This unique walk starts with the Parsi Agiyari which is located exactly across the Jewish Synagogue—the only one in Gujarat. We then walk towards Teen Darwaza, where an intriguing historical account of what happened in 1920 awaits! The inconspicuous 500-year-old Jain derasar near Manek Chowk, is where we end the walk. Please email a Copy of your photo ID proof to h2oasis.meghna@gmail.com soon after registering for this walk. Also carry your photo ID proof copy on the day of the walk. Parking available near Khamasa Cross Roads.